Cowley College is committed to providing affordable, high quality education. We understand the challenge of balancing military duties with your academic goals and family. Taking this into account, we offer a variety of classes to prepare military students for a four-year program, assist with promotion, or enter the work force. Classes can be taken face to face, online, or in hybrid format. The Kansas Army National Guard, Pittsburg State University, and Cowley College have a linkage agreement that provides new opportunities to students. 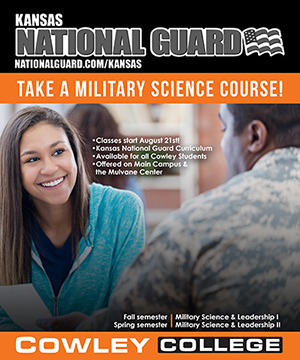 Currently there are two courses in Military Science available to all Cowley College students. The Military Science and Leadership I course will introduce students to the personal challenges and competencies that are critical for effective leadership and communication. Students will learn how the personal development of life skills such as cultural understanding, goal setting, time management, stress management, and comprehensive fitness relate to leadership, officership, and the Army profession. As students become further acquainted with Military Science and Leadership, they will learn the structure of the Reserve Officers’ Training Corps (ROTC) Basic Course program. The focus is on developing basic knowledge and comprehension of Army leadership dimensions, attributes and core leader competencies while gaining an understanding of the ROTC program, its purpose in the Army, and its advantages for the student. The Military Science and Leadership II course will introduce Cadets to the personal challenges and competencies that are critical for effective leadership. Cadets will learn the personal development of life skills such as critical thinking, time management, goal setting, and communication. Cadets will also learn the basics of the communications process and the importance for leaders to develop the essential skills to effectively communicate in the Army. Cadets will begin learning the basics of squad level tactics that will be reinforced during a weekly lab facilitated by Military Science Cadets and supervised by Cadre. Both Military Science Leadership I and Military Science and Leadership II will be offered at Cowley College’s main campus in Arkansas City as well as its Mulvane Center. Kansas National Guard members receive free tuition up to 15 credit hours per semester, matched to the highest State School In-State Rate. The lifetime cap is 180 Credit Hours. Apply for Federal Student Aid (FAFSA). A screen shot of your completed application must be emailed to the Kansas Education Services Office. Create an account on the Kansas Board of Regents website. Complete the online Application/Student agreement each semester. Email a Transcript (does not have to be official transcript) each semester to the Kansas Education Services Office. You MUST APPLY no later than August 31 for the Fall, or January 31 for the Spring semester. The Student Loan Repayment Program (SLRP) is available for those who have one or more qualifying and disbursed Title IV federal loan The loans must be listed on the Department of Education National Student Loan Data System (NSLDS) aid summary website. Federal Parent Loans for Undergraduate Students (PLUS) that are in the name of anyone other than the Soldier applying for the SLRP program are not eligible for repayment. Cowley has a dedicated Military Education Services Representative who will assist the military student through the admission process all the way until graduation. Cowley’s Financial Aid code is 001902. Complete the Housing Application and Contract if you intend to live in the residence halls located at Arkansas City. Note: Transcript can also be received electronically through Parchment or National Student Clearinghouse. Apply for Veteran/Tuition Assistance. Please use the links below based on service. Visit the Cowley College Bookstore to obtain your books.